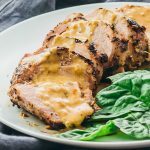 An easy way to cook ultra-tender roasted pork tenderloin with a creamy mustard sauce. Pat the pork tenderloin dry with paper towels. If unseasoned, season all sides with salt and pepper. Heat an oven-safe pan over medium-high heat. Coat the bottom of the pan with olive oil. Add pork and cook until browned on one side, about 4 minutes. Flip the pork in the pan. Bake at 375 F until the pork is browned and cooked through, about 25 minutes (thermometer inserted in the center should read at least 145 F). Transfer the pork to a plate and let it rest while you work on the next step. Do not slice yet. Add all sauce ingredients to the pan over medium heat. Scrape off any bits that have stuck to the pan. Stir until the cheese and butter are melted. Let the sauce simmer until it reaches a thick consistency, about 5 minutes. Slice the pork into thin slices and drizzle the sauce on top. Optionally serve with a side of greens.